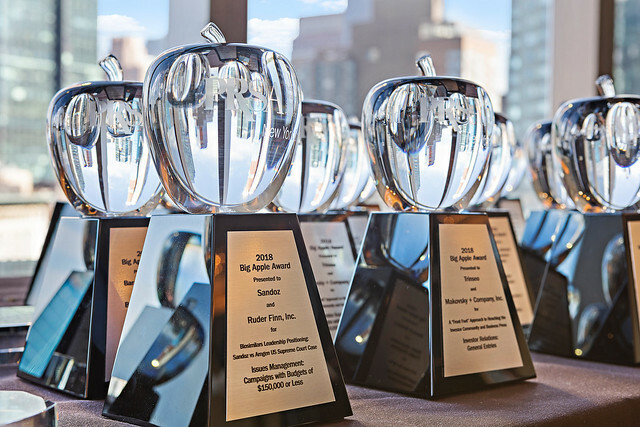 Registration is now open for the 32nd Annual PRSA-NY Big Apple Awards Gala which will be held on Monday, June 24th at the Mandarin Oriental, New York. This prestigious awards program honors outstanding communications campaigns and projects developed or implemented in and around New York City. Our 2019 program recognizes the best work of 2018 submitted by in-house (association, corporate and government) communications teams, agencies of all sizes, and independent practitioners across the New York metro area and there is still time to enter in certain categories! The unveiling of Big Apple Award Campaign winners, Spotlight winners, and honorable mentions is kept secret until announcement at the celebratory gala. Early Bird pricing is available now through May 17, 2019. Regular pricing will be in effect from May 18, 2019 through Tuesday, June 18, 2019. Advance registration is required to guarantee entry. 2019 Big Apple Awards Gala Sponsors!